It’s not just me then. Parking really is getting more difficult. First of all, my favourite chocolate bar used to be the size of a year old baby’s forearm. My Dad claims that it only looks smaller now because my hands are bigger but that simply isn’t true. I used to feel physically sick after stuffing two of them in my mouth consecutively but now I can eat 3 without any adverse side effects. Except facial spots and an expanding waistline, of course. Secondly, my bed seems to be shrinking. My feet now dangle off the end and they never did this before. Unless I have continued growing into my thirties it is clear that my bed is shrinking. Could it be related to global warming? Everything else seems to be these days. Finally, and this is where my sanity is saved, UK parking spaces are shrinking. It’s official. I remember when I was a lad you could park a 200 seat bus in a normal space in the street and still have room at the side to pitch your tent and host a rather pleasant picnic. Nowadays you need to be a contortionist to get out of your car because it has to be jammed so close to your neighbour. My wife says that it is my parking which is getting worse but now I know that she is wrong. It has been confirmed that our parking spaces have decreased by about 10% in the last 10 years. This relates to residential spaces outside homes, in driveways and in garages connected to houses. To make things even worse, cars are getting bigger; 4% in the same time period in which the spaces have shrunk. 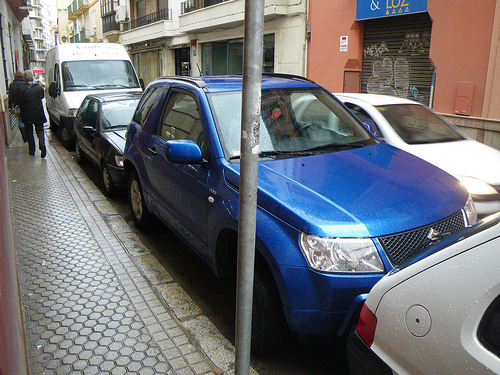 This entry was posted in Musings, News and Views and tagged car, LS, seat, UK by Robert Bell. Bookmark the permalink.